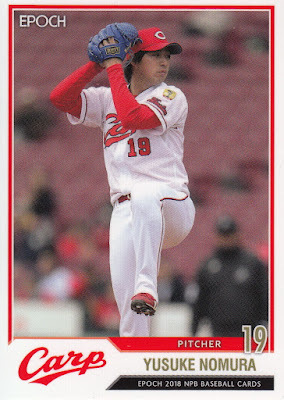 This season has not been kind so far to either the Red Sox or the Carp. 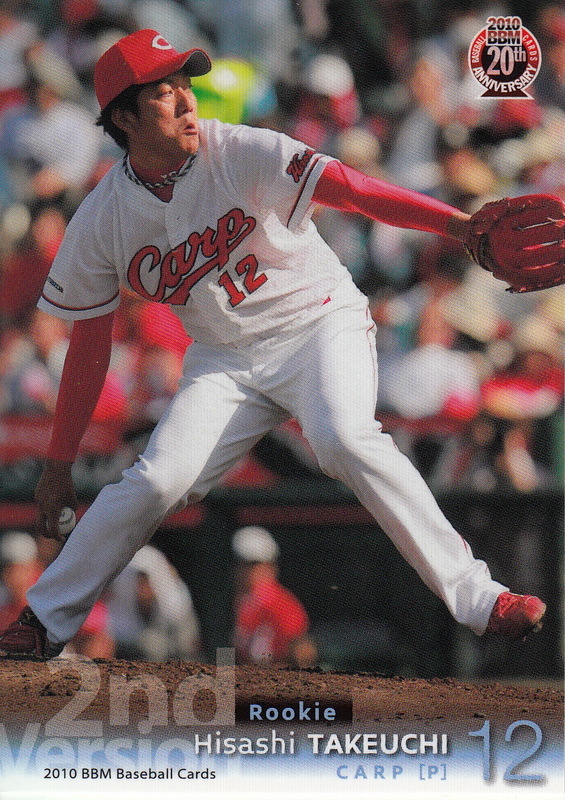 They both have nearly identical records - the Red Sox are 8-13 while the Carp are 8-12. They have both moved out of last place lately but part of that has been because of more hapless teams (the Baltimore Orioles and the Hanshin Tigers) although both teams won their first series this weekend. 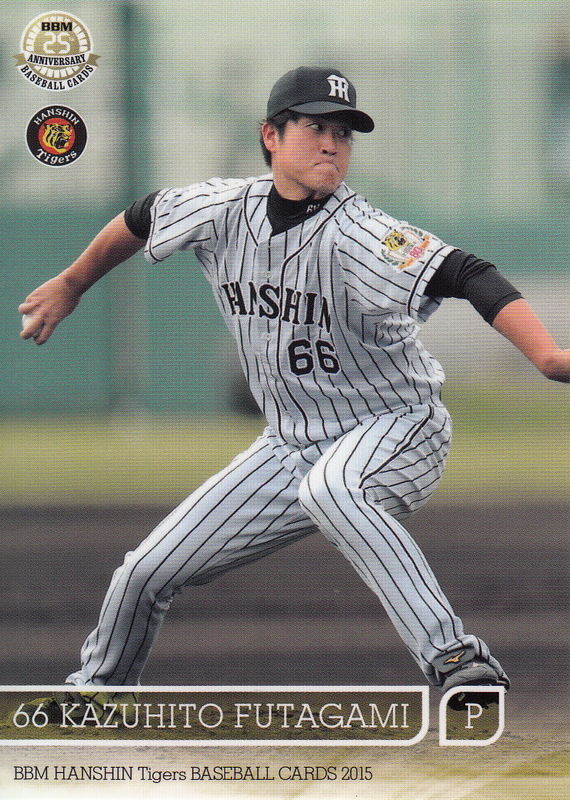 2009 BBM Tokyo Big Six Spring Version Set - Where Are They Now? 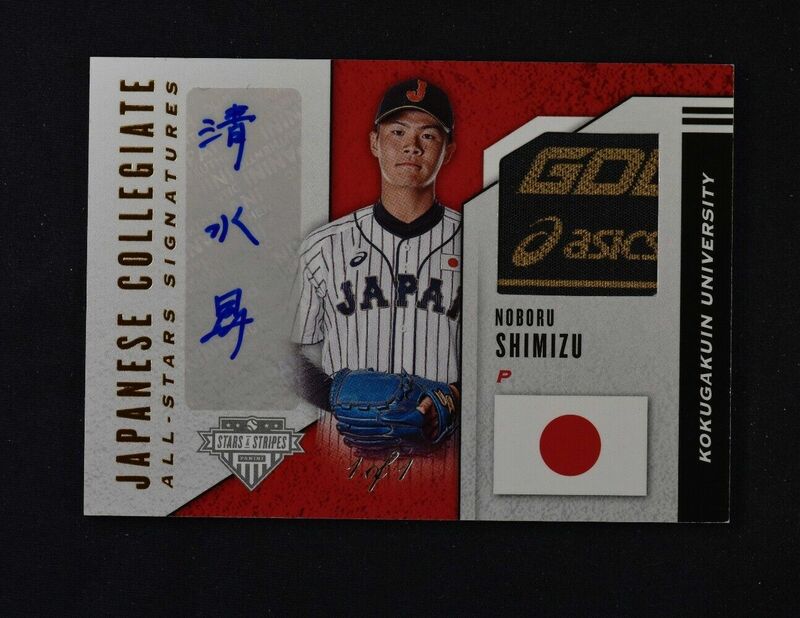 BBM's fourth collegiate set was released in April of 2009. The Tokyo Big Six Spring Version set was a box set containing 60 total cards - 54 player cards (nine from each team) and six team cards. Eleven of those 54 players would go on to play in NPB. 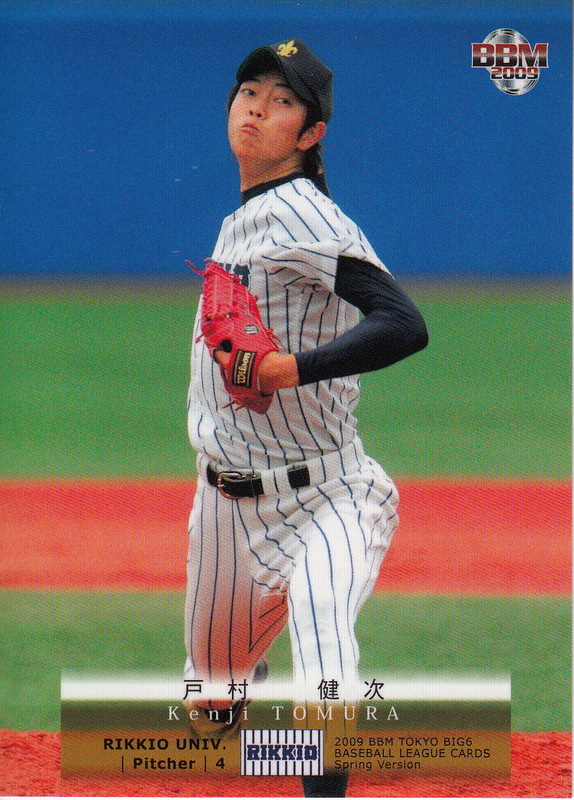 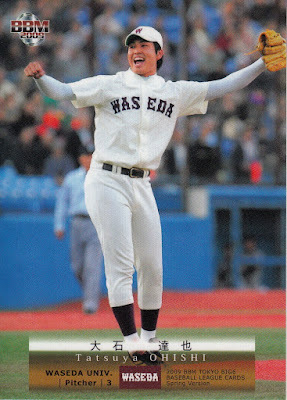 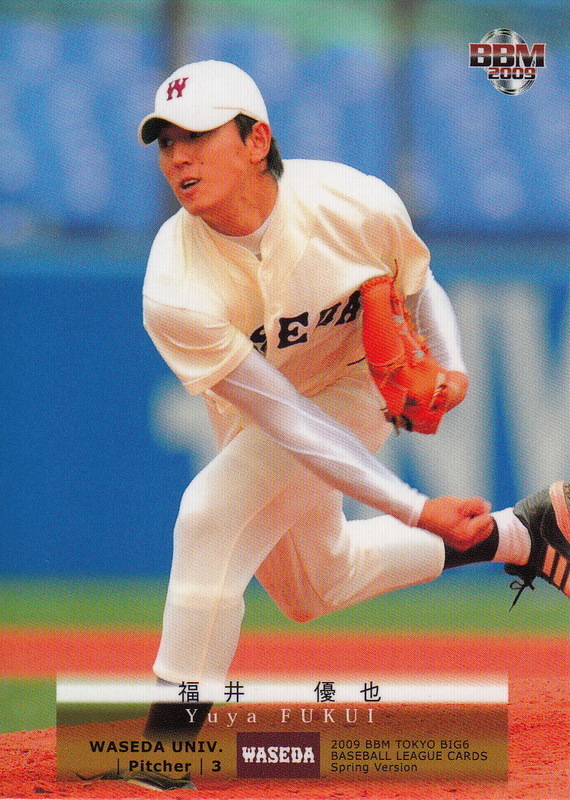 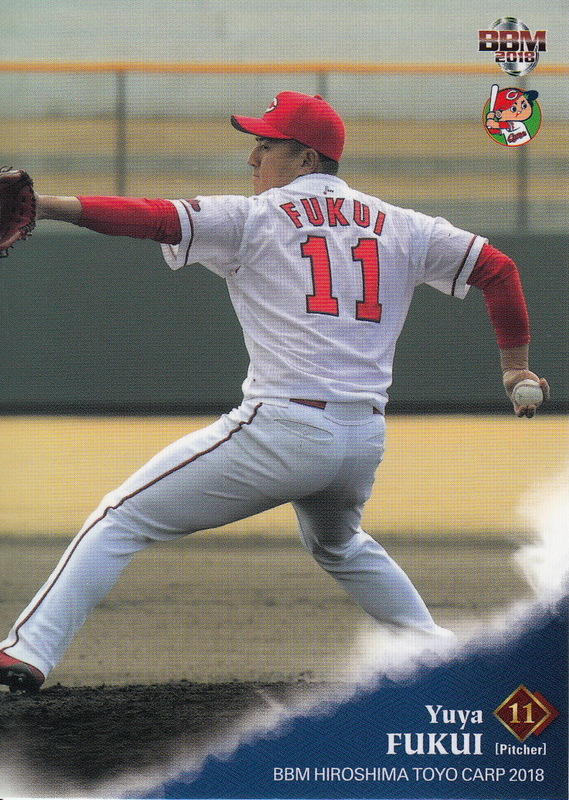 Five of those eleven have their first cards ever in this set - Toshiki Abe, Fumiya Araki, Yuya Fukui, Kisho Kagami and Kenta Matsushita. 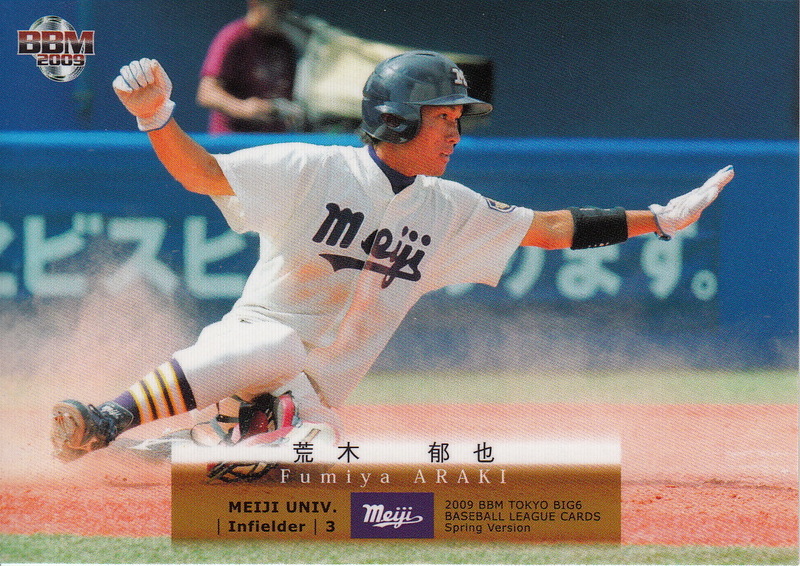 Here's a summary of the future NPB players in the set. 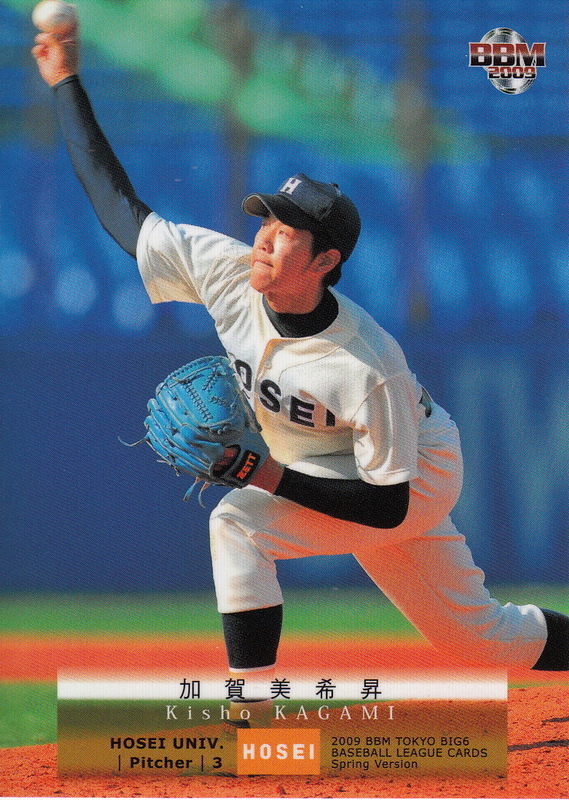 Seven of them are still active. 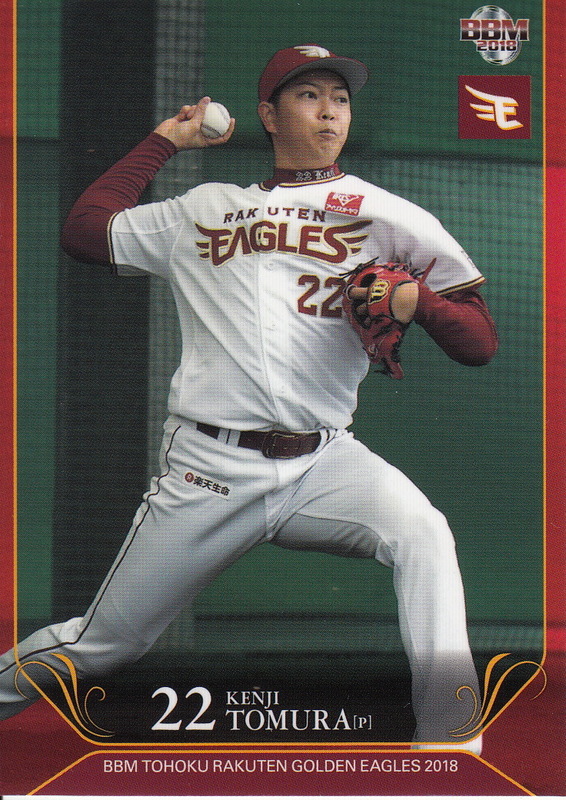 Yuya Fukui Waseda 3 2010 Carp 1st Played for Carp 2011-2018, Eagles 2019-present. 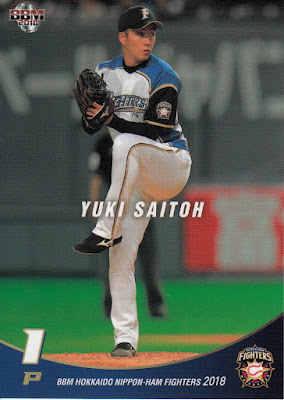 Here's each player's card from the set plus a card of them from NPB. I've tried to get one of the most recent cards I have for the player although I'm also trying not to repeat cards for players who've been in the previous sets. 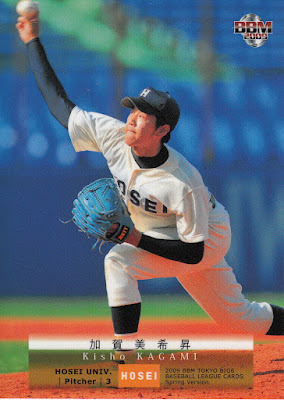 Of the remaining 43 players in the set, fifteen had the only card ever in this set: Yudai Kajiya (Hosei), Shingo Kamegai (Hosei), Nagomu Kasai (Toyko), Takuma Kobayashi (Meiji), Hiroki Kojima (Waseda), Yusuke Kusada (Waseda), Yuki Maeda (Rikkio), Takayuki Morita (Meiji), Yuki Murayama (Keio), Msashi Nanba (Hosei), Yusuke Ohmae (Waseda), Kazuya Onodera (Keio), Tetsuya Urushibata (Keio), Yosuke Yamakawa (Waseda) and Ryota Yasuda (Meiji). 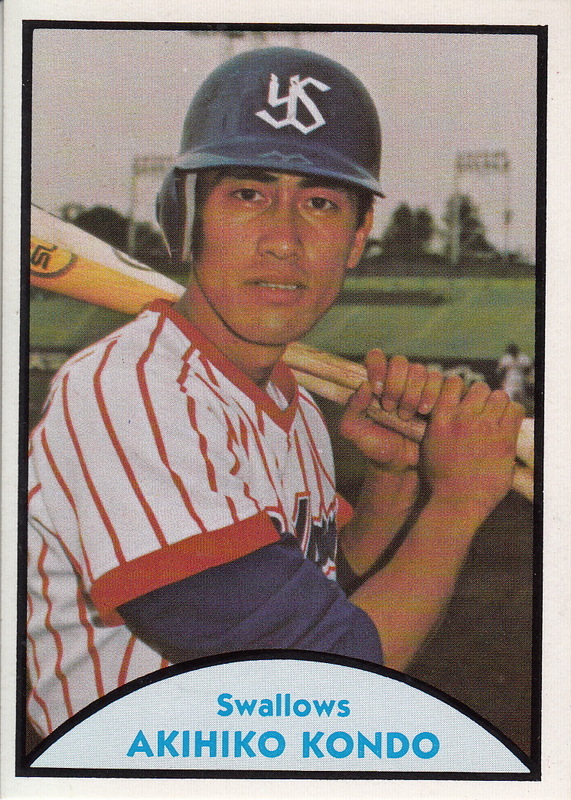 The other 28 players also appeared in one or more of BBM's previous three collegiate sets and/or one or more of their seven later sets. 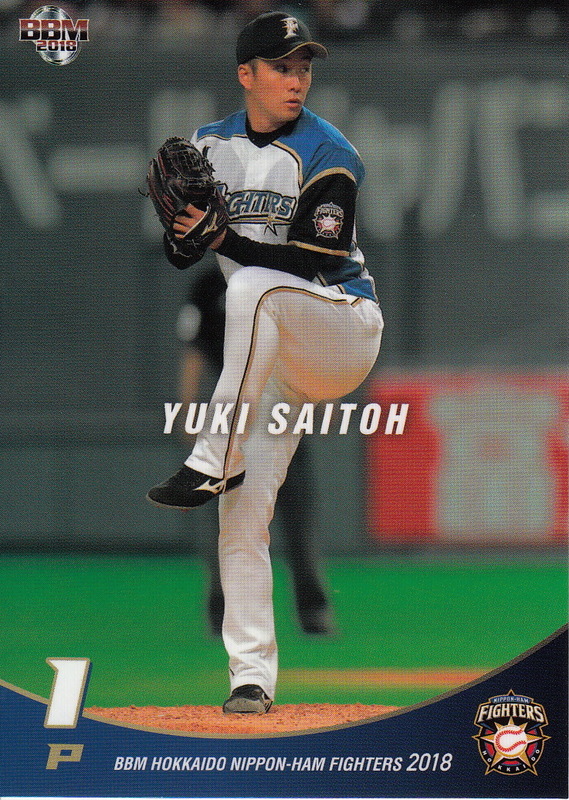 Tohoku Rakuten Golden Eagles manager Yosuke Hiraishi had to get kind of creative today in their game against the Orix Buffaloes. 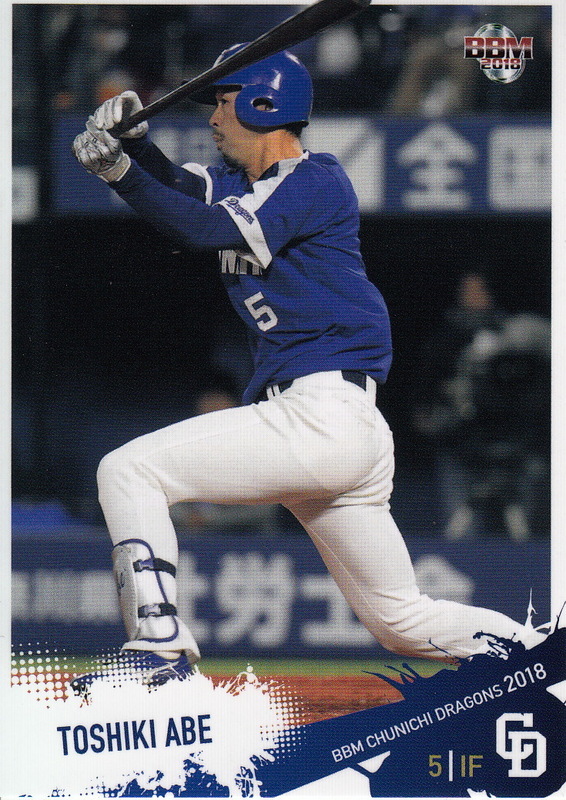 The Eagles were down 5-1 in the seventh inning when he pinch hit for his starting catcher Motohiro Shima with Louis Okoye to lead off the inning. Okoye struck out but the Eagles managed to score a run in the inning. Backup catcher Yuichi Adachi replaced Shima in the field for the next two innings. 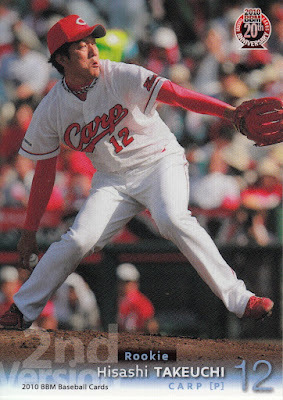 When Adachi's spot came up in the ninth with one out, Hiraishi brought in Kazuya Fujita to pinch hit for him. Fujita hit a single that started a game tying rally for the Eagles. But now the Eagles were in a bit of a pickle - the game was tied but who was going to catch? Hiraishi took his first baseman, Ginji Akaminai, and suited him up in the tools of ignorance. 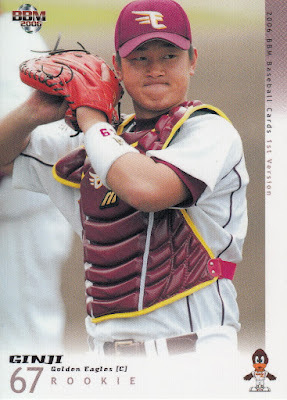 This was not quite as random as it seemed since Ginji (as he is known) had played catcher in high school and was actually drafted by the Eagles in 2005 as a catcher. But he hadn't played the position since 2009 with the ni-gun team and had never caught in an ichi-gun game. The Buffaloes failed to get a baserunner in the remaining three innings so Ginji was not challenged again. 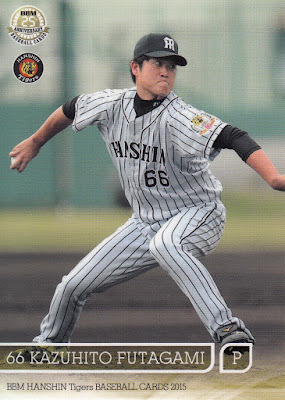 He didn't make any errors and wasn't charged with any passed balls so the emergency move by Hiraishi was an apparent success. A couple weeks ago Panini issued a set for USA Baseball called "Stars & Stripes". 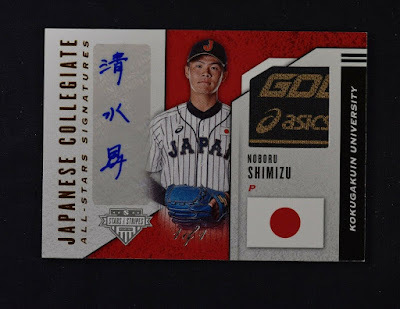 Normally this isn't something I'd be paying much attention to but Panini included autograph and memorabilia cards for members of the 2018 Japanese Collegiate All Star team (specifically the one that took part in the Haarlem Baseball Week tournament that took place last July in the Netherlands) so the set turned out to be something I was interested in. 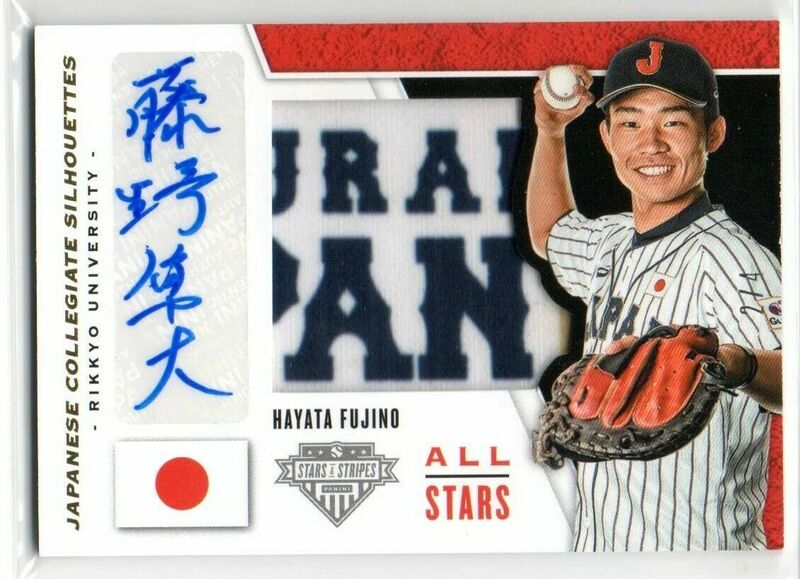 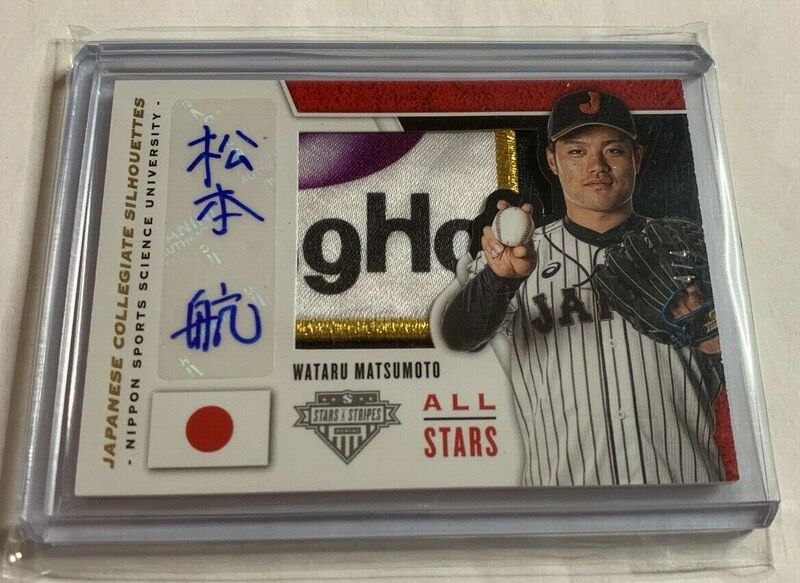 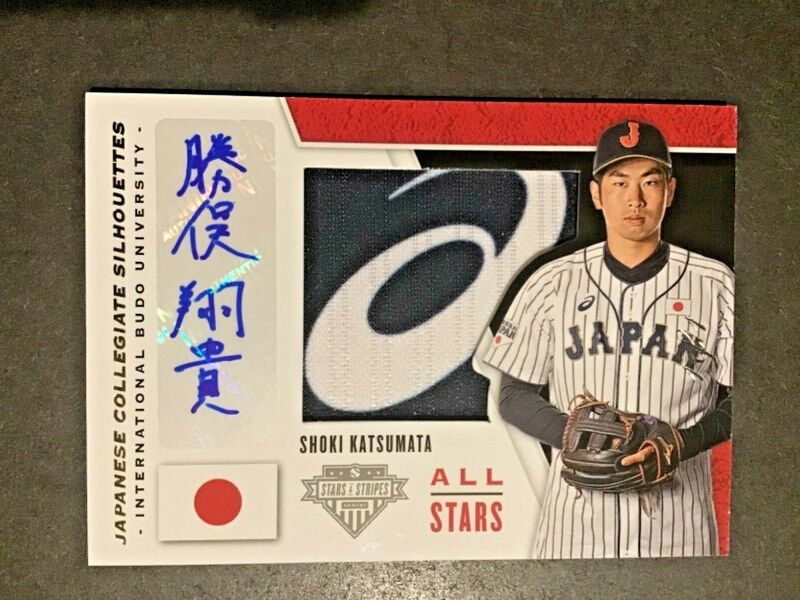 This is the second time that Panini has included autograph and/or memorabilia cards for a Japanese Collegiate All Star team (the first being in 2013) and the third time overall that a US manufacturer has done it (Upper Deck did it in 2007). One big difference between these cards and those two previous sets is that the cards from the previous sets were either autograph cards or memorabilia cards while the new cards are both. 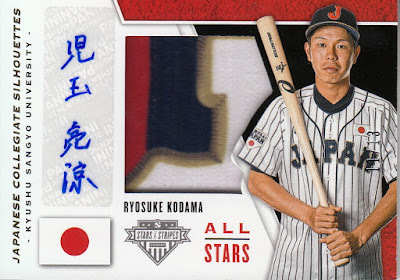 I've been putting off writing about this set until I got one of the cards from it. It took eight tries on Ebay but I finally won a card the other day and it arrived in the mail today. 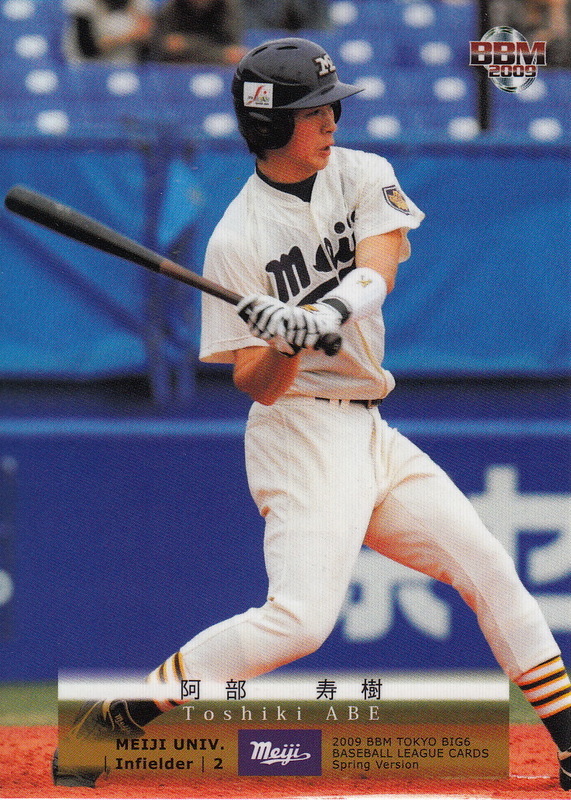 That's it at the top of the post. 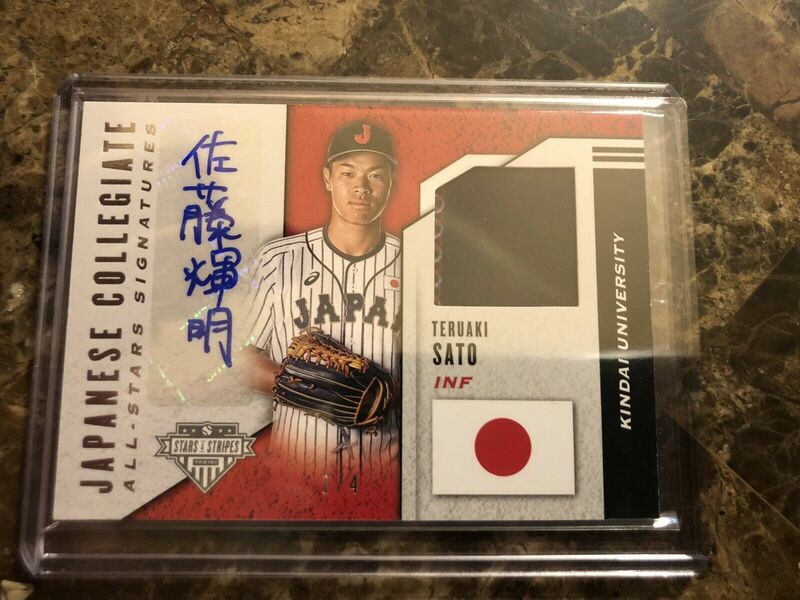 I put together a list of the players in the set with their colleges, their year in college (my best guess anyway based on their age) and if they had been drafted. 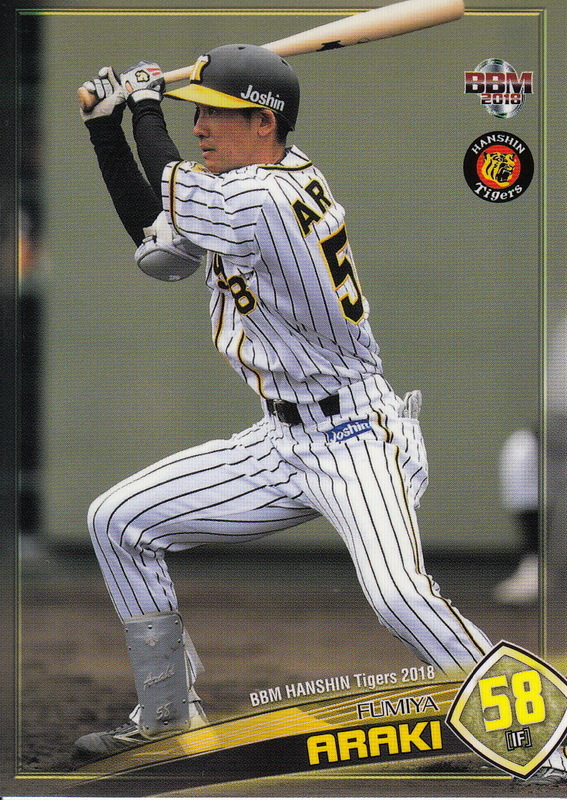 Eight of the 24 players were taken in last fall's NPB draft including four players who were first round picks. 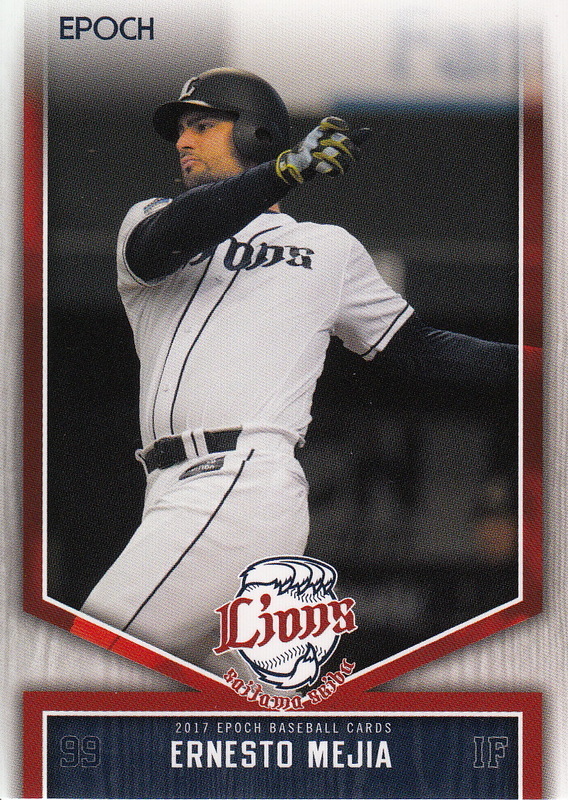 There were four other players who I think were seniors last year but weren't drafted - I don't know if they have gone to the independent or corporate leagues. 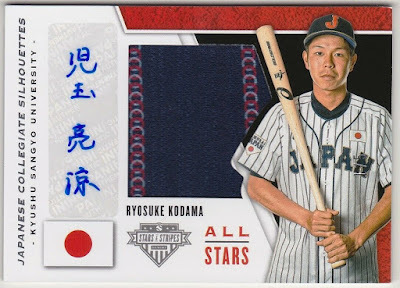 You can see that despite having names like "Jersey" and "Signature", each card has both an autograph and a piece of memorabilia. I like that the signatures are in kanji - they look better than the ones in English on the 2013 cards. 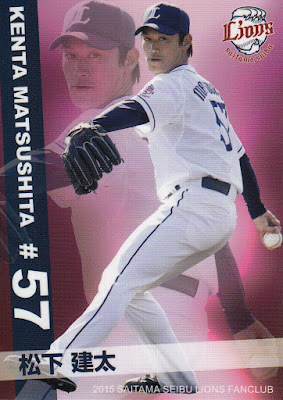 Here's what the back of the card I got looks like. I'm kind of disappointed that unlike the 2013 Panini cards there's no biographical information about the player on these cards. 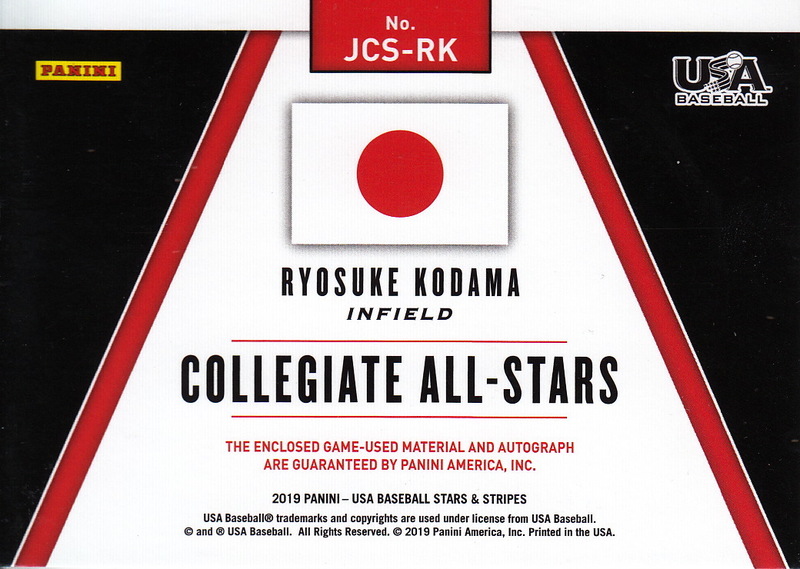 The set also contains similar cards for the Chinese Taipei Collegiate All Star team. 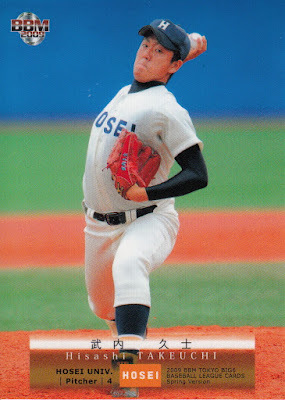 There was a Taiwanese team at the Haarlem Baseball Week tournament also but I don't know if this is that team. Since I don't know anything about the CPBL I don't know if any of the players in the set have turned professional. I probably won't seriously try to complete this set but I'll do what I've been doing with the 2013 set - pick up the cards when they are available for a reasonable price. 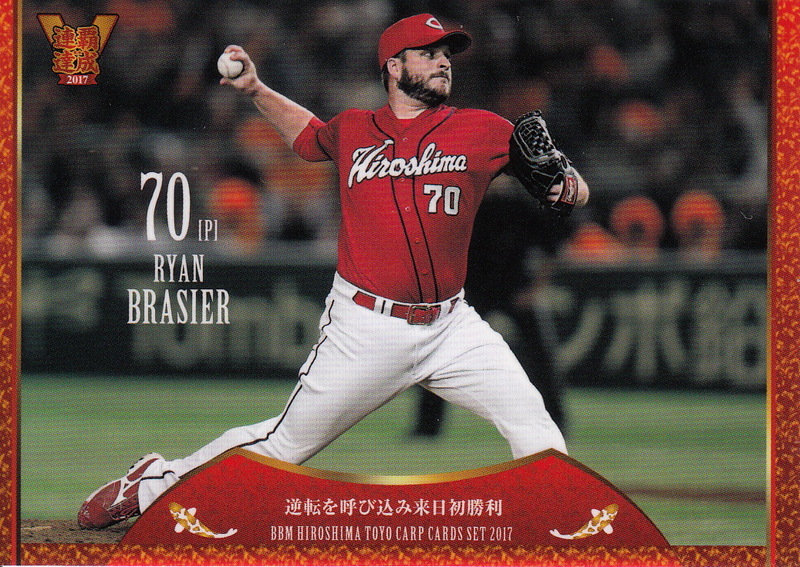 There were only 25 of each card from the 2013 set but if you take all 10 versions of each card into account there are 42 cards for each player in this set! 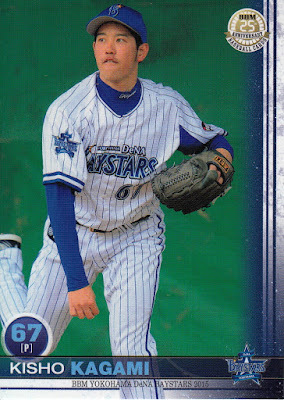 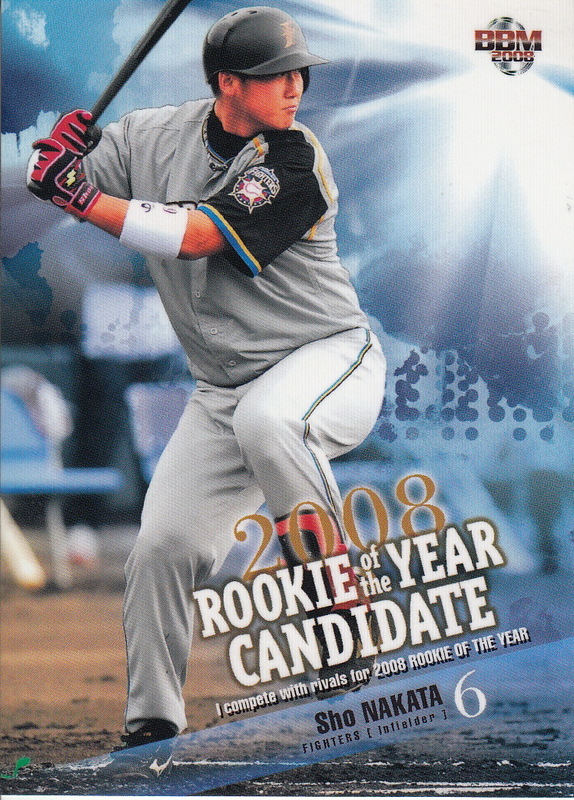 Despite his inclusion in this subset, Nakata wasn't actually a candidate for the Rookie Of The Year award in 2008 as he spent the entire season with the Fighters' farm team. 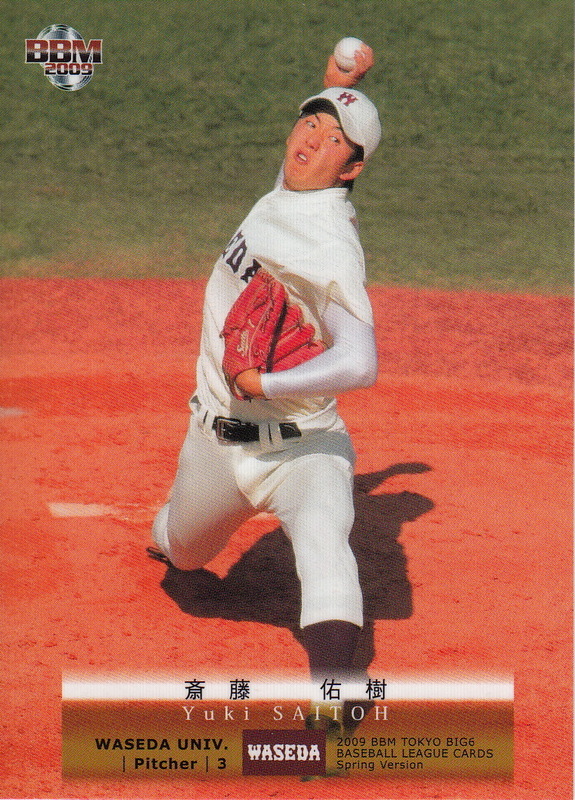 He made his ichi-gun Fighters debut in 2009 and didn't become a regular with the top team until 2011. 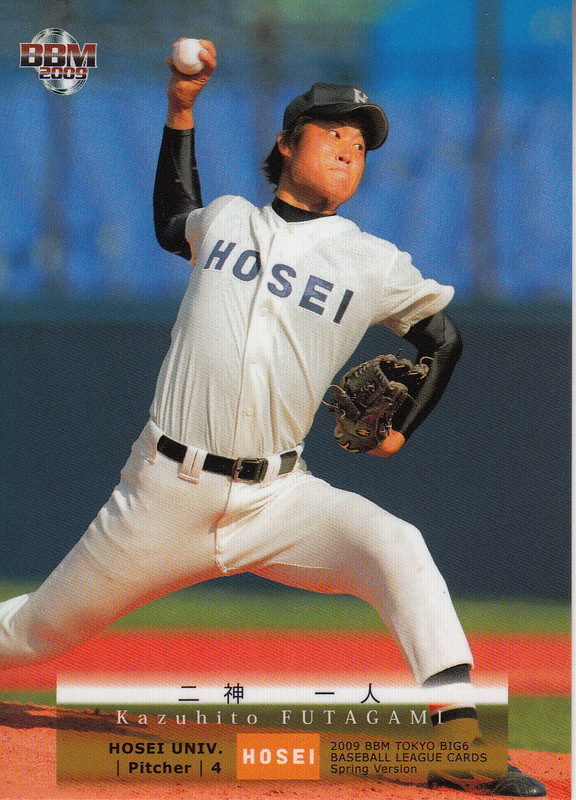 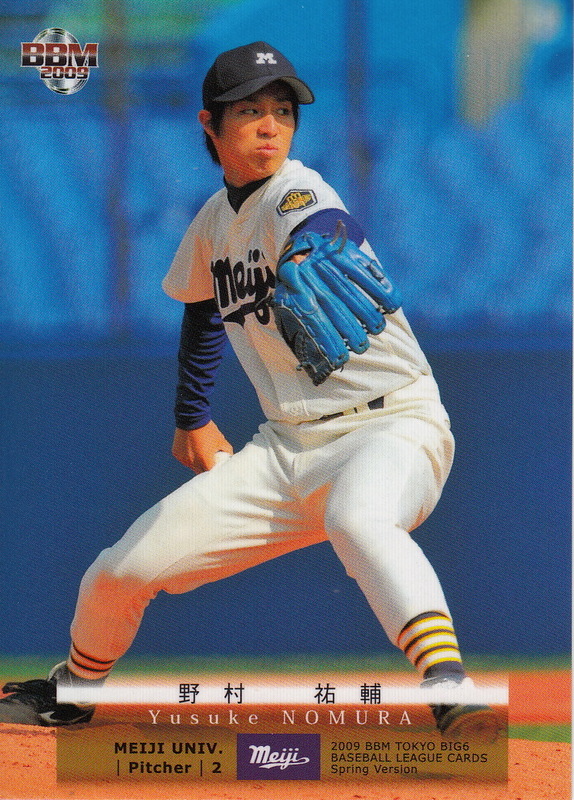 The actual 2008 Pacific League MVP was Satoshi Komatsu of the Orix Buffaloes who was not included in the subset. Akihito Kondoh, who manned second base for the Taiyo Whales in the 1960's, passed away this past week at age 80. 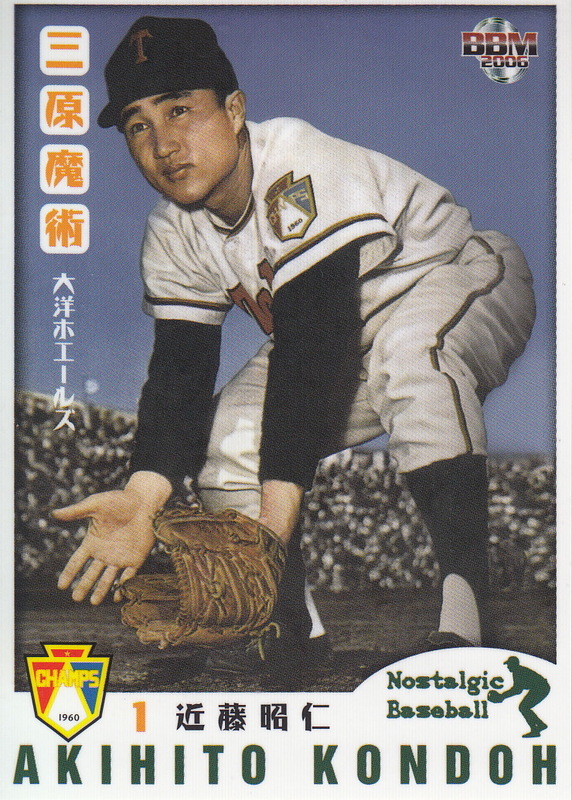 Kondoh signed with the Whales after graduating from Waseda University and made his debut with them in 1960. Taiyo won their first Central League pennant that season and defeated the Daimai Orions in the Nippon Series in the first ever four game Series sweep. 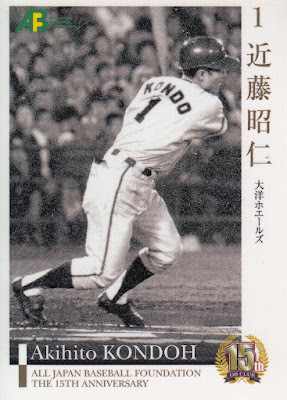 Kondoh's solo home run in the ninth inning of Game Three broke a 5-5 tie and proved to be the game winner. He followed that the next day with an RBI single in the fifth inning of Game Four that plated the only run of the game. 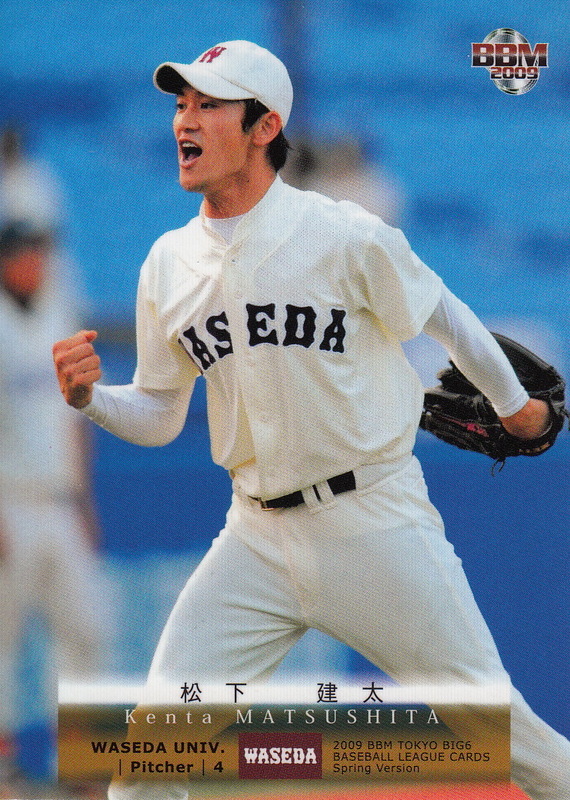 He was named the MVP of the Series. The rest of Kondoh's career was relatively unspectacular. 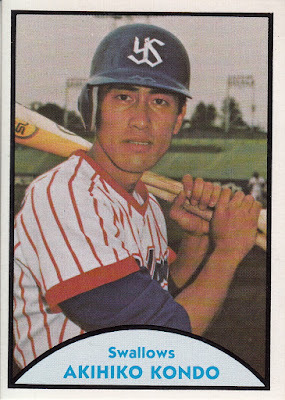 He was the Whales regular second baseman through the 1971 season and spent two seasons as a bench player before retiring following the 1973 season. He made the Central League All Star team twice - 1962 and 1965. 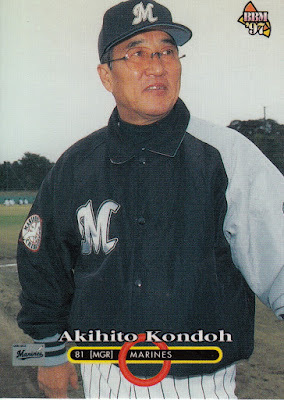 He became a coach after his playing days were over, coaching for Taiyo from 1974 to 1978, the Swallows from 1979 to 1981, the Lions from 1982 to 1986 and the Giants from 1989 to 1991. 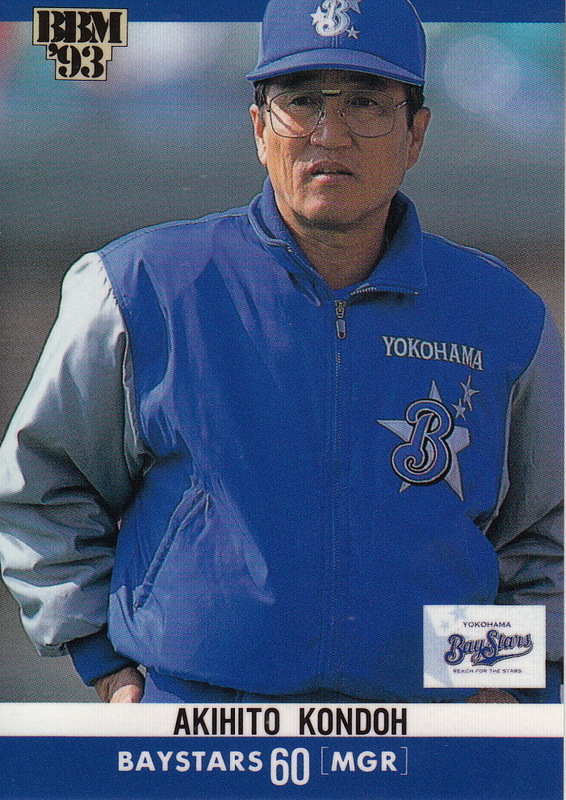 He returned to his old team as manager in 1993 (becoming the first manager of the newly renamed Yokohama Baystars) and ran the team for three seasons. 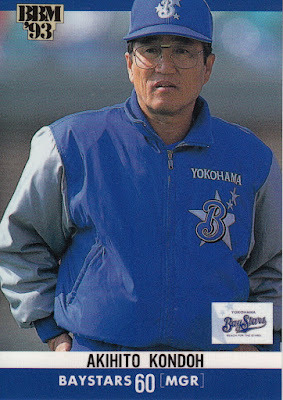 He managed the Chiba Lotte Marines from 1997-98 and returned to the Giants to coach again in 2006. I was surprised when I went to pull cards for this post to discover that I didn't have any cards from him that came out when he was playing. 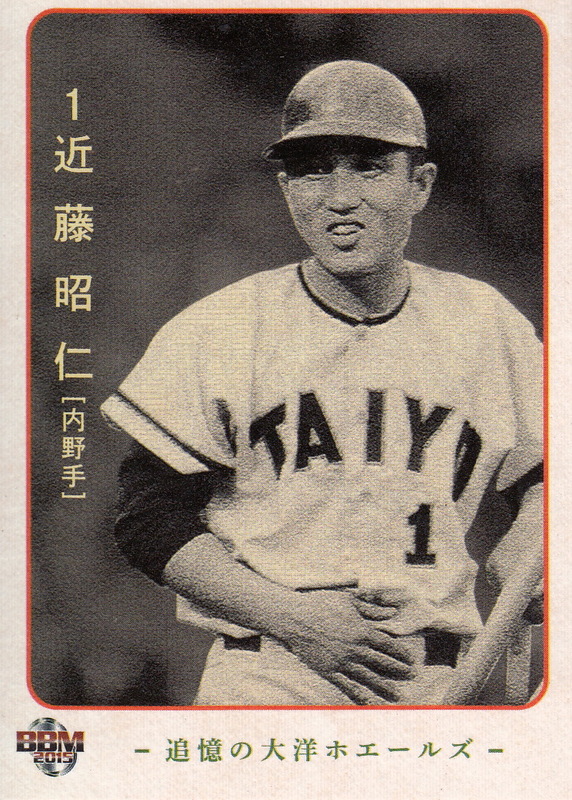 After doing a little research I discovered there's a reason for that - he only had five cards that appear in Engel's latest guide and a couple of those are somewhat obscure - 1960 Marusho Flag Back menko (JCM 13a), 1960 Sakai Gum (JF 49), 1961 Union Oil Taiyo Whales (JA 1), 1962 Shonen Club Flag Back Playing Cards (JGA 180) and the 1979 TCMA set (when he was a coach for the Swallows). He also doesn't show up in BBM or Epoch's OB sets very often - there's only about five of him as a player since 1998 with another two commemorating his managerial career. 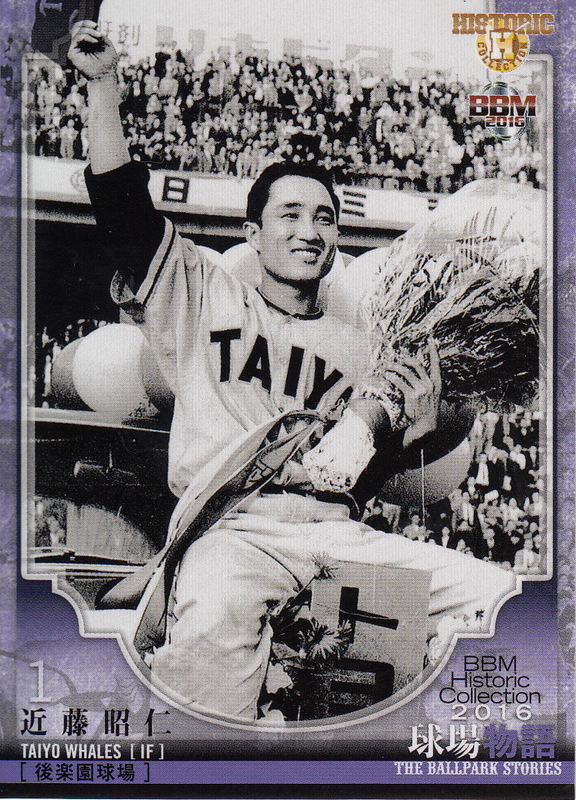 If it's not obvious the card from the 2016 BBM The Ballpark Stories celebrates him winning the 1960 Nippon Series MVP award. 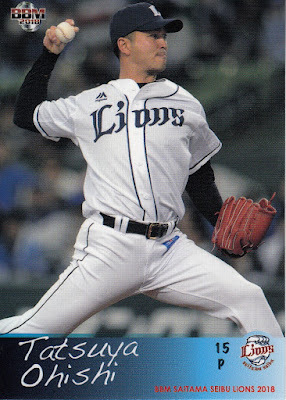 His name is misspelled on the TCMA card.